What is "diversity" and how does it make us stronger? This guiding question is the inspiration for our whole-school Inquiry Unit: Diversity is our Strength. Students began by exploring what "diversity" means. They are already well versed in the concepts of “difference" and were ready to dig deeper to understand broader ideas of diversity and how it goes beyond the colour of our skin. Guided self-exploration to understand what makes us unique was a good place to start. We all have different interests, families, cultures, faiths, experiences, abilities, influences, priorities, aspirations and perspectives that make us individuals. Our students reflected about their own lives and who they are in these different respects to understand their own identity and appreciate their individuality. 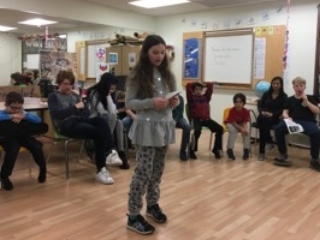 In a whole-school "show and tell" event, students and staff had the opportunity to open up and share more about who they are, and what they bring to our community as individuals. Students use art to express their self-identity. Students present artifacts that represent their interests, traditions, influences and Values to give insight into who and what has helped shape their identities and their perspectives. Throughout our self-exploration, students had opportunities to dig deeper to learn about their families and traditions through "home assignments". Learning first hand about their ancestors proved to be fascinating for both students and families as they worked together to build family trees. With the help of his great-grandmother, one student even traced his ancestry back to a King of England, Edmund Ironside! What better way to celebrate our diverse traditions than through food? We concluded our self-exploration and appreciation of diversity with an amazing potluck lunch shared amongst students, parents and friends! There were so many different dishes, from pancakes to perogies, kimchi to kugelis, everybody found something tasty and new to try! It was also great to learn about the history or cultural significance of the different foods, and why they were special for our students and their families. By learning to appreciate the diversity amongst our own school community, we've opened the door to exploring diversity and its importance in our larger society. Next up...We're travelling "around the world" to learn about cultural diversity!